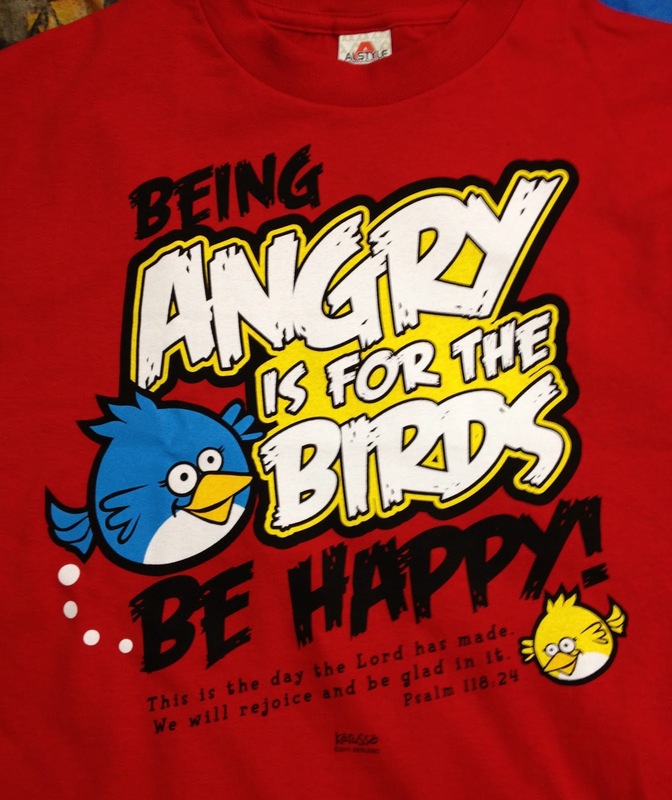 I never used to be into T-shirt evangelism, but now I can honestly say I'm beginning to like it. 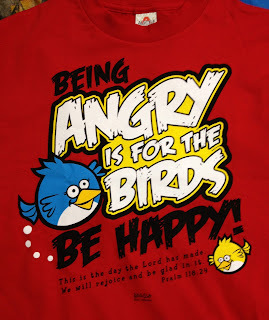 A few days ago I got a shirt that says, "Being angry is for the birds, be happy!" with Psalm 118:24 written below. It's a spin off of the sensational Angry Birds game and has brought quite a few laughs and comments from people I don't even know. It's a great "connecting" device, and it's been fun to strike up conversations with people based solely off my shirt. But it really isn't about the shirt. A macho guy wouldn't be found wearing an "I love pink" shirt with hearts and flowers plastered all over the front. A quiet girl wouldn't be found wearing a flamboyant shirt that reads, "I am a Facebook stalker." People wear shirts based on their personalities. What you wear very much reflects who you are. It doesn't matter whether you're wearing a "Love others because Jesus loves you" shirt or whether you're loving people because Jesus loves you, it's all about what you do. So from now on, whether you're wearing a shirt with a message or not, make sure your life has a message. Sometimes it's easier to know what our shirts are saying than what our lives are saying. What are people reading by your actions? Awesome thoughts, Seth! :) Don't you just love shirts with a message? It's as if your outward appearance wears the love of God in your heart. I should get a shirt like that! Thanks for sharing. Hmmm, that's a neat way to put it! "Wearing the love of God" for others to see.